FOXMOTION: Fade your calls directionally, i.e. left-to-right, to “sell” your call sequences as genuine and natural. FOXFUSION: Mix and match two sounds simultaneously during a call sequence. FOXPITCH: Manipulate the pitch of your game calls to make them more unique and truly add a new dimension to your call library. FOXDATA: Our personal favorite feature — this is a real-time data storage program that brings true analytics to your predator hunting. Access your data after your hunts to see what conditions (what temperature was it? what moon phase? what barometer reading?) were most productive and deadly during your hunt. This really allows you to iterate on your technique and improve as a predator hunter. 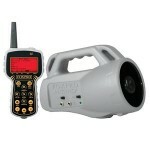 The FOXPRO Shockwave has four speakers - two tweeters, and two horn speakers. This guarantees unmatched sound and volume ability. 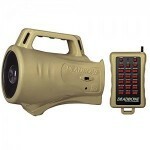 Like other units in the FOXPRO family, the Shockwave unit has two external speaker jacks if you need more sound. But honestly, the only time you could possibly need more sound from your Shockwave is if you’re going out in a blizzard. The Shockwave has an additional auxiliary jack to connect your Predator Decoy if you have one. 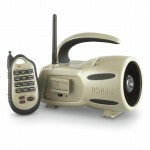 This is one of our favorite programmable coyote calls for a reason. Although the FOXPRO Shockwave comes with 100 quality FOXPRO calls pre-loaded, you can store up to 1,000 additional calls of your own. When in the field, you’ll enjoy using your TX-1000 remote; it has a full color LCD screen with efficient, easily navigable sound lists/categories. This unit also comes with more electronic features than you can count on two hands — including a barometer indicator, moon phase indicator, temperature sensor, battery level, timer, and patented FOXFUSION, FOXMOTION, FOXPITCH, FOXDATA, and FOXBANG technologies. Comes with 100 calls of your choice, and is programmable with a 1,000 call capacity. One good free resource for more calls can be found here. Moon phase, temperature, and barometer readings. Timer and real-time clock included too. FOXDATA - Your true hunting analytics platform. Real-time recording of temperature, moon phase, barometer, stand duration, shot time, etc. 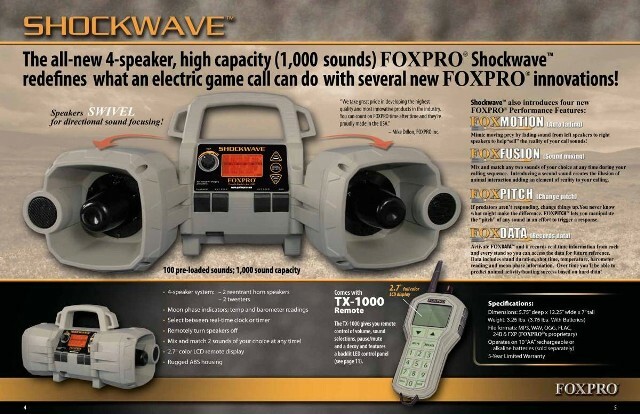 Why Buy the FOXPRO Shockwave? 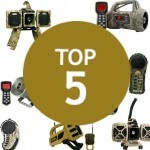 The FOXPRO Shockwave is loaded with the best features we've ever seen in an electronic coyote call. FOXPRO's Shockwave isn't cheap at its $500-$600 price range, but for the predator hunter who wants it all, you can finally have it all. FOXPRO has gone all-in on their warranty policy, knowing the quality of their tech is unmatched, maybe even legendary. Almost every unit they sell has a multi-year warranty. The FOXPRO Shockwave has the longest warranty of any FOXPRO electronic call. Buy with confidence. At 3.5 lbs, this unit is a bit less portable than its little brother, the 1.5 lb FOXPRO Inferno. In reality, the difference between 3.5 lbs and 1.5 lbs isn't noticeable for the typical predator hunter. The Inferno is built with FOXPRO's rugged ABS Composite Material. ABS has been tested in the toughest environments. It's also made in the USA and the Inferno is covered by a 3 year limited warranty. This unit is unlike any other predator call we've ever reviewed because it has true data collection and hunting analytics. If you're already a stud hunter, the only way you're going to get more technically adept is by diving into data. FOXDATA lets you review every hunt you take the FOXPRO Shockwave on. You can see the times you were most successful, and the times you had more difficulty. That alone is worth the price tag. You can finally take your skill to the next level. This is, hands down, the best electronic coyote call we have ever used. If you aren't scared by the price tag, the FOXPRO Shockwave is a must-have. Buy it and never look back. You'll probably never need to buy another electronic caller in your life.